See that ecstatic looking, smiling blonde girl in the lower center of this photo? That’s me, a Classics Major, having a dandy time in a Geology class of all things. Ever since I declared my major, I’ve been in this mindset of all things humanities: Latin, Greek, writing, and history. I signed up for this 100 Level Environmental Geology class for one purpose and one purpose only: to fill one of my science distribution credits. I signed up viewing this class as a chore–something I had to do, dragging my feet, kicking and screaming. Yet, here I am, a semester later, smiling and thanking myself for taking this not-at-all-humanities science class. The reason for my gratitude? Not necessarily the subject–sorry bio and geo majors–but because of the way it was taught. This is something I have experienced multiple times already being at Whitman: a class’s subject material is a small part of what can make the class enjoyable. The main reason I love this class? Field Trips! This Environmental Geology class has some in-class labs, but sometimes we get to load up in Whitman vans and go see sights that we didn’t even know existed around Walla Walla. The first trip we took was to the sights of the Mill Creek Flood Control Project, which included Rooks Park and Bennington Lake, where we got to see the structures that are in place for preventing Walla Walla from going underwater. 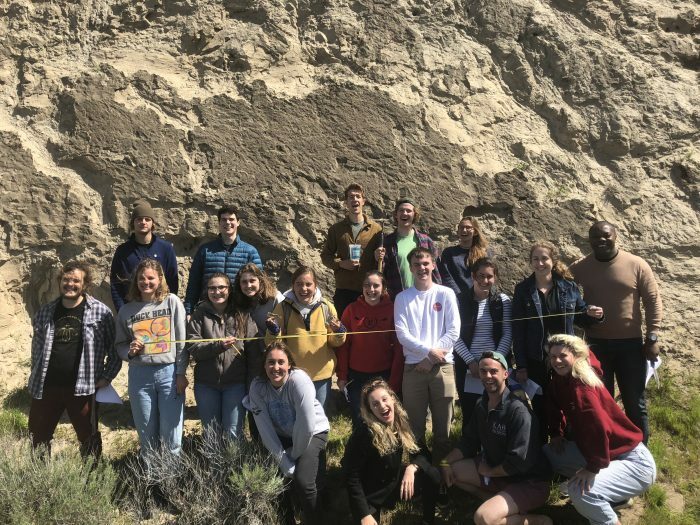 Our next field trip (and my personal favorite) took us to the Wallua Gap, a giant divide in the Columbia River where our class got to go on a short hike which was concluded by a drawing session of the Twin Sisters. Our third and final field trip was our outing to see the Touchet beds, walls of horizontal layers of sediment. This photo shows us in front of these beds–we used a self timer in order to get everyone in the photo. After 3 or 4 tries, we finally got a class photo that makes me smile every time I look at it due to the pure joy that each of our faces displays. While it’s true that most of us didn’t feel like going out to see sediment at 1pm on a relaxing Tuesday afternoon, we all ended up having fun together as a class, as we always do. The reason I’m writing about this experience is because I find it crucial to drive the point home that you shouldn’t always trust the first expectations you might have about a certain class. I quite honestly dreaded taking a science class; but, in the end, I only dread the day that it ends. I guess that’s what you get when you go to a liberal arts college. Make the most of what you do, not just at Whitman, but in all things–who knows what might just rock your world! Thank you Sarah Murphy for this fine and thoughtful blog entry!